Um em cada quatro militares americanos que lutaram na Guerra do Golfo entre 1990 e 1991 ainda sofre as seqüelas do conflito, revelou hoje um relatório federal. Estima-se que na operação militar lançada para responder à invasão do Kuwait por parte das tropas do então presidente iraquiano Saddam Hussein tenham participado pouco menos de 700 mil soldados americanos. O mal, identificado como "síndrome do Golfo Pérsico", seria conseqüência da exposição a substâncias tóxicas, incluindo pesticidas, assim como um remédio administrado para proteger as tropas dos gases neurológicos, indicou o relatório. "Os testes científicos não deixam dúvida de que a 'doença do Golfo' é um problema real com causas reais e graves conseqüências para os ex-combatentes afetados", informou o relatório preparado por um comitê de especialistas e ex-militares por ordem do Congresso. A "doença do Golfo" é constituída por "uma complexa variedade de sintomas" que incluem problemas persistentes da memória e da concentração, dores de cabeça crônicas, transtornos gastrintestinais e outras disfunções. Embora alguns veteranos de guerra afetados pela doença tenham conseguido se recuperar com o tempo, o relatório indica que até o momento não se identificou uma cura específica. "Esta investigação põe ponto final a um dos capítulos mais obscuros do legado da Guerra do Golfo", disse Anthony Hardie, um dos membros do comitê, em entrevista coletiva. "Trata-se de uma vitória agridoce, porque isto é o que os ex-combatentes (dessa guerra) estiveram dizendo todo o tempo. O Governo federal desperdiçou anos...tratando de rejeitar qualquer coisa que afetasse os veteranos", acrescentou. RAC 2014 - "Gulf War Illness and the Health of Gulf War Veterans: Research Update and Recommendations, 2009-2013"
IOM 2010 - "Gulf War and Health, Volume 8: Update of Health Effects of Serving in the Gulf War (2010)"
RAC 2008 - " Gulf War Illness and the Health of Gulf War Veterans"
RAC 2004 - "Scientific Progress in Understanding Gulf War Veterans' Illnesses"
White et al, Cortex 2015 - "Recent research on Gulf War illness and other health problems in veterans of the 1991 Gulf War: Effects of toxicant exposures during deployment"
Kansas/Steele Case Definition - "Prevalence and patterns of Gulf War illness in Kansas veterans: association of symptoms with characteristics of person, place, and time of military service"
Iowa Persian Gulf Study Group. "Self-reported illness and health status among Gulf War veterans: A population-based study"
Haley Case Definition - "Is there a Gulf War Syndrome? 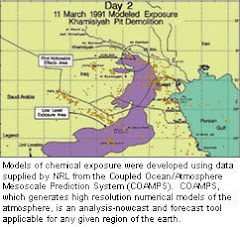 Searching for syndromes by factor analysis of symptoms"
Haley & Tuite, 2012, "Meteorological and intelligence evidence of long-distance transit of chemical weapons fallout from bombing early in the 1991 Persian Gulf War"
Haley & Tuite, 2012 - "Epidemiologic evidence of health effects from long-distance transit of chemical weapons fallout from bombing early in the 1991 Persian Gulf War"
Fukuda/CDC Case Definition - "Chronic multisymptom illness affecting Air Force veterans of the Gulf War"
Veteranos del Golfo Persico "Argentina"
91outcomes.com is a health and news website for veterans of the 1991 Gulf War. 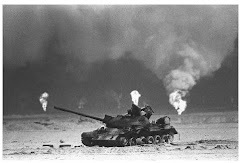 The health outcomes of the 1991 Gulf War continue to profoundly affect between one-fourth and one-third, according to official estimates, of the war’s nearly 700,000 U.S. veterans. They also affect innumerable fellow veterans from our Coalition partners, including the UK, Australia, Canada, and the Czech Republic, to name just a few. The aim of 91outcomes.com is to provide fellow Gulf War veterans and their caregivers, advocates, and loved ones, with a credible source of information for health information on Gulf War Illness and other news, all in one place, some of which isn't available anywhere else. Allow me to introduce myself. I'm Anthony Hardie, the publisher and editor of 91outcomes.com. I created 91outcomes.com in 2009** because I'm also one of the 250,000 veterans of the 1991 Gulf War afflicted by Gulf War Illness, and this is what I choose to do to help my fellow Gulf War veterans. Of course, there's much more that remains to be done -- please feel free to jump in and help however you may see fit to fill those many gaps. I've been continuously active as a national advocate on Gulf War and other veterans' issues since 1995, shortly after my honorable discharge after seven years of U.S. Army service that included serving in the 1991 Gulf War and Somalia. Later, in part because of that advocacy work, I was selected to be a Congressional aide, and then a veterans’ affairs state agency executive. If you're really interested, you can read more about me on my Google profile. I also do my best to to help my fellow Gulf War veterans by serving as an affected veteran on the programmatic panel that leads and guides the Gulf War Illness Research Program, part of the Congressionally Directed Medical Research Programs (CDMRP). And, I'm a former longtime member of VA's Research Advisory Committee on Gulf War Veterans' Illnesses (RAC) and the VA’s Gulf War Illness [Research] Steering Committee. In my service on these panels, I do my very best to represent the many other ill and affected Gulf War veterans, including the readers of this website. **NOTE: Much of the content on 91outcomes is "fair use" content archived for personal use and for single-site archival use by other Gulf War veterans. Articles dated prior to 2009 are archival in nature, and are pre-dated concurrent to the time noted in the article. The content contained herein was not prepared by medical professionals and it is not intended, nor should it be considered, as a substitute for medical advice. The information provided on this website is intended as educational material, designed solely to support, and not replace, the relationship that exists between a patient/site visitor and his/her healthcare professional. The material contained herein is general in nature and may not apply to your particular factual or legal circumstances. Online readers should not act on this information without seeking professional counsel and advice. 2016-02-23 - HVAC - "Persian Gulf War: An Assessment of Health Outcomes on the 25th Anniversary"
2013-03-13 - HVAC - "Gulf War: What Kind of Care are Veterans Receiving 20 Years Later?" 2010-07-27 - HVAC - "Gulf War Illness: The Future for Dissatisfied Veterans"
2009-07-30 - HVAC - "The Implications of U.S. Department of Veterans Affairs' Limited Scope of Gulf War Illness Research"
2009-05-19 - HVAC - "Gulf War Illness Research: Is Enough Being Done?" 2007-09-25 - SVAC - " OVERSIGHT HEARING ON RESEARCH AND TREATMENT FOR GULF WAR ILLNESSES"
2007-07-26 - HVAC - "Gulf War Exposures"
2002-01-24 - HVAC - "Ten Years After: Lessons From the Gulf War"
1999-11-16 - HVAC - "Possible Health Effects of Pyridostigmine Bromide On Persian Gulf War Veterans"
1999-10-26 - HVAC - "Hearing on Persian Gulf War veterans issues"
1998-07-16 - HVAC - "Hearing on the standards for adjudicating claims presented by veterans suffering from hepatitis C, cerebral malaria and Persian Gulf illnesses"
1998-06-04 - HVAC - "Markup of the Persian Gulf War Veterans' Health Care and Research Act of 1998"
1998-02-05 - HVAC - "Hearing to receive updates on research, investigations, and programs involving Persian Gulf War veterans' illnesses"
1995-05-12 - HVAC - "Veterans Benefits Administration's processing of compensation claims, with an emphasis on Persian Gulf War claims; oversight of P.L. 103-446, Veterans' Benefits Improvements Act of 1994"
1995-03-09 - HVAC - "Progress of Research on Undiagnosed Illnesses of Persian Gulf War Veterans"
91otucomes.com. Website created by Anthony Hardie. Simple theme. Powered by Blogger.